Facebook, one of the biggest social network sites in the world is known for changing its visuals and bringing about various minor changes from time to time. The recent big change they brought to the Facebook accounts was the Facebook Timeline. A lot of people tried it out, and many did not even touch it. 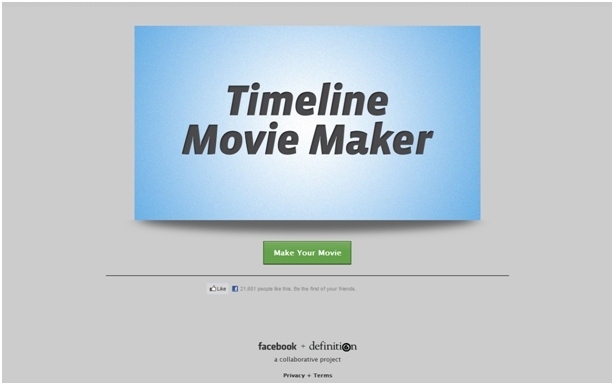 For the ones who have got bored with changing their timeline profile pictures and Timeline Covers, they should check out the Timeline Movie Maker. It is third-party software designed by definition6 in collaboration with Facebook. This software auto generates a movie based on your timeline. Once the movie is created and ready, the users have the option to edit the pictures shown in the movie and also the soundtrack (which can be chosen from original, nostalgic, cinematic, romantic and playful). So if you are bored with the Facebook timeline, it is time to create a movie and flaunt it.